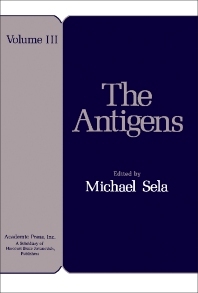 The Antigens, Volume III is a comprehensive treatise covering all aspects of antigens, including their chemistry and biology as well as their immunologic role and expression. Topics covered range from microbial polysaccharides and lymphocytic receptors for antigens to antigenic determinants and antibody-combining sites. Allergens and the genetics of allergy are also explored. Comprised of seven chapters, this volume begins with a review of microbial polysaccharides as antigens, followed by a discussion on antigenic determinants and their specific reaction with antibody-combining sites. The reader is then introduced to the reaction of antigens with their specific receptors on lymphocytes. The next four chapters are concerned with several categories of more complex antigens which, in most cases, have yet to be characterized adequately at a molecular level: allergens, histocompatibility antigens, antigens of Mycoplasmatales and chlamydiae, and animal viruses. The book concludes with an analysis of virus infections and the immune responses they elicit. This monograph will be of interest to practitioners and researchers in immunology, experimental and clinical medicine, biochemistry, and other disciplines. VI. B Lymphocyte Memory and "Original Antigenic Sin"